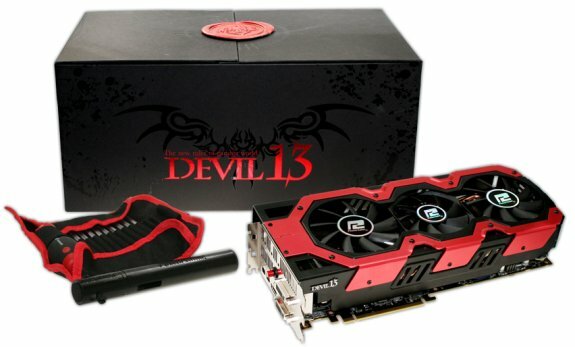 PowerColor introduces the Devil 13 Radeon HD 7990, a new video card with two Radeon HD 7970 GPUs clocked at 925MHz, a 1000MHz boost mode, and 6GB GDDR5 memory clocked at 5500MHz. The card features DL DVI-I, SL DVI-D, HDMI and two Mini-DisplayPort outputs. Special accessories include a screwdriver tool kit and a PowerJack. TUL Corporation, a leading manufacturer of AMD graphic cards, today reveals the 1st and only dual TAHITI XT GPU solution: the PowerColor Devil 13 HD7990. Designed to tackle the demanding HD titles, the Devil 13 HD7990 has default settings at 925MHz engine clocks and 1375MHz memory clocks. Furthermore, it’s equipped with dual BIOS switch button, boosting up the engine frequencies to 1GHz, breaking out the limitation of extremely gaming performance. The Devil 13 HD7990 is built with high efficiency thermal solution and solid components onboard. With trio fans and 10pcs U-shape heat pipes, maximizing the heat dissipated ability to cool down the Devil 13 board. Also, it includes 12+2+2 phases, digital PWM, super cap, UHB and PowerIRstage—all these platinum power kit enhances stability and reliability voltage for GPU with minimum conduction losses and lower temperatures at load, delivering the steadiest and most secure power to boost for performance. The Devil 13 HD7990 includes industry leading brand, Wiha Tool Kit; with Wiha multiple reversible blades set, gamers can easily utilize different blades to fix every machine. Also, it packs with PowerColor PowerJack, the professional graphics card supporter which provides the powerful force to support the weight of the card from the back, avoiding card bending in the case.